BluedanBOB's Pub MY WORK MY WAY Artist Alley Young Dan Art! BluedanBOB's Pub MY WORK MY WAY Artist Alley Young Dan Art! BluedanBOB's Pub MY WORK MY WAY Artist Alley Young Dan Art! Here's a peak at a sketch courtesy of 8 year old Dan, after the little tyke saw Return of the Jedi in the theaters. Gape in Awe at the faithfully recreated Sail Barge, Skiff, and Sarlacc pit! 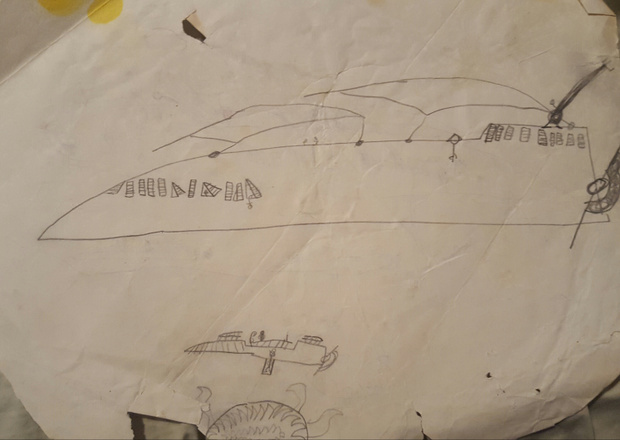 I doubt that I could draw Jabba's Barge any better than that now! So you've been drawing since ROTJ? Yep, and a few years prior. Star Wars captured my imagination like no other.